UE’s General Executive Board (GEB) met in Pittsburgh for three days last week to review the work of the union since the 75th convention and make plans for 2018. Secretary-Treasurer Andrew Dinkelaker reviewed the union’s budget. Board members had an in-depth discussion of the financial situation facing the union. The lengthy discussion demonstrated a shared commitment to making difficult decisions, if necessary, to preserve UE and rank-and-file trade unionism. The board also made plans to have a special, one-day meeting in March to continue this discussion, and the discussions will inform next year’s budget, to be adopted at the June GEB meeting. The executive board were joined for the first day of the meeting by Peter Kennedy from Unifor, UE’s partner union in Canada. Kennedy was the first Secretary-Treasurer of Unifor when they were founded in 2013. Now retired, he serves on the UE-Unifor North American Solidarity Project Study Group. UE General President Peter Knowlton gave an overview of the work of the North American Solidarity Project, and upcoming joint work between UE and Unifor. 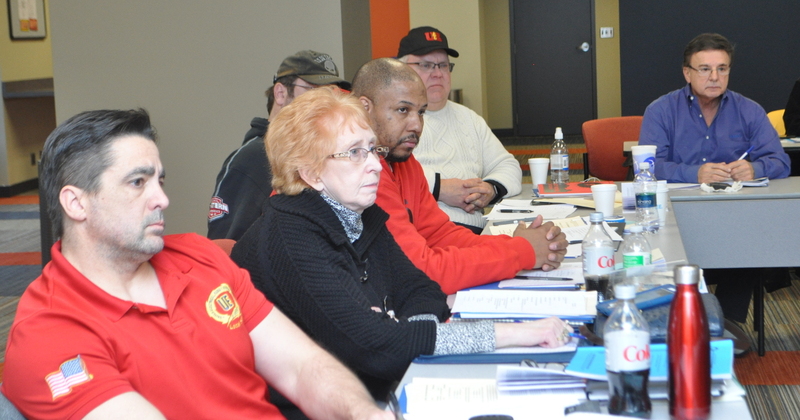 In March, the Study Group will hold a two-day discussion of new approaches to union political action, and in April, UE and Unifor will organize a joint delegation to the Labor Notes conference in Chicago. He then introduced Kennedy. GEB members then engaged Kennedy in a robust discussion of how unions can be more relevant to the broader working class. Local 893 President Becky Dawes spoke about how in her work as a child-abuse investigator for the state of Iowa she talks with families about economics, and the effects of political decisions on the elderly, women, workers and the poor. Eastern Region President Donna Morgan reported how Local 170 is utilizing new technology and social media. Local president Jamie Beaton recently made a video update about the local’s political action efforts, which has been viewed thousands of times on Facebook. Elizabeth Jesdale, Local 255, spoke about the importance of involving younger members in order to create the next generation of leaders, and also her excitement about Unifor’s work with equity-seeking groups. The board also discussed the best ways to keep rank-and-file UE members informed as the North American Solidarity Project develops. In addition to ongoing joint work between UE and Unifor around organizing, General Electric, and the North American Free Trade Agreement, the Study Group will continue to meet and will present a set of written recommendations to the executive boards of both unions in the fall. Director of Organizing Gene Elk presented the organizing plan developed to implement the UE convention resolution “Organize the Unorganized,” approved by delegates in August. The plan, based on a rigorous quantitative analysis of UE’s organizing work in recent years, creates two four-person organizing teams, each led by an experienced organizer. The teams, based in Pittsburgh and Chicago, will travel extensively through UE base areas as they target various employers and workplaces for organizing with the goal of bringing in over 1,000 new members each year. Elk noted that unemployment is relatively low, and workers have rising expectations. “Theoretically, this should be a good time to be doing lots of organizing work,” he said, but “we have to run more campaigns to get more members.” He pointed out that in recent years, UE has been organizing “on a shoestring budget,” and that rebuilding the union’s ranks requires that the union be able to put organizers into the field who are dedicated solely to organizing, and organizing teams that are large enough to be able to continue to organize while negotiating first contracts. Elk also outlined for the board a selection of industries and employers that UE organizers will be targeting. The targeting choices take into account various types of leverage that Unifor could potentially exert to assist UE’s organizing, as well as the aim of bringing in a mixture of low-wage and high-wage workers to maintain a balanced base for UE’s progressive per capita system. President Knowlton gave the Political Action report, highlighting the fact that the report of the Policy Action Committee from last year’s convention committed the union to work on healthcare for all and independent rank-and-file political action. On the issue of healthcare, he noted that UE locals are once again seeing double-digit increases in health insurance premiums, and suggested that this created a good opportunity to do political education with UE members about the need for a universal, “Medicare for All” single-payer healthcare system. He also announced that National Nurses United will be putting significant resources into making support for single-payer a “litmus test” for politicians in the 2018 and 2020 elections. On the topic of independent rank-and-file political action, Knowlton reported on the success of pro-labor candidates across the country in local and state elections in November, and on the growth of Labor for Our Revolution, the organization that is continuing the work of Bernie Sanders’ presidential campaign among the labor movement. Director of Organization Elk noted that the union is looking at ways that Our Revolution and Labor for Our Revolution can assist the UE organizing program. The board voted to donate $2000 to Labor for Our Revolution. Knowlton also reported on UE’s work on the renegotiations of the North American Free Trade Agreement (NAFTA), which has devastated manufacturing communities across the U.S. In October, the UE brought trade unionists and community organizations from the U.S., Canada and Mexico together in Chicago to strategize about NAFTA. President Knowlton also spoke at a press conference in December in Washington, DC, organized by the “#ReplaceNAFTA” coalition of labor, farm, environmental, faith and other groups. The GEB voted to sign UE on to a #ReplaceNAFTA letter to Congress, demanding that Congress replace NAFTA with a new fair trade agreement that stops outsourcing of jobs and protects consumers and the environment. Local 106 President Jim Borowski amended the motion to also send the letter to UE locals to sign on as well (if your UE local wants to sign on, please email UE International Director Kari Thompson at kthompson@ueunion.org by the deadline of February 15). Knowlton also announced that UE will be organizing a delegation to the Labor Notes Conference in April in Chicago, and Western Region President Carl Rosen reported that long-time UE ally Rev. Dr. William Barber, leader of the North Carolina Moral Mondays movement, has joined a new effort called the Poor People’s Campaign. The Poor People’s Campaign, building on the legacy of Dr. Martin Luther King, Jr.’s final campaign, plans to organize civil disobedience to focus attention on economic justice and workers’ and poor people’s issues. President Knowlton distributed to board members a legal report prepared by UE General Counsel Irene Thomas, which covered recent changes issued by the National Labor Relations Board (NLRB). Knowlton reviewed the document, pointing out that Trump appointees to the NLRB are leading the charge to roll back the modest improvements workers’ rights implemented during the Obama administration. Most notable among these Obama-era decisions being overruled are the Browning-Ferris “joint employer” ruling, which allowed workers of subcontractors to bargain with the company that actually calls the shots, and procedures that led to speedier elections. Both rulings were critical to the success of Local 228 in organizing close to six hundred workers at the National Visa Center. The International Report highlighted the work being done to unite GE workers around the world and the recent attacks on workers’ rights in Mexico. The GEB also voted to renew UE’s membership in U.S. Labor Against the War (USLAW). Western Region President Carl Rosen reported that USLAW’s major area of work right now is Korea, because of President Trump's belligerence toward North Korea. USLAW is organizing a delegation this spring of trade unions to meet with South Korean trade unions. The current South Korean government was elected with labor support, and wants to de-escalate tensions with the north, explained Rosen. President Trump, on the other hand, wants to use tensions with North Korea as an excuse to spend trillions of dollars on new nuclear programs. President Knowlton gave the Education Report, announcing that the Education Department will be running a workshop on sexual harassment at the upcoming regional council meetings, and will make this training available to locals. National Trustees Autumn Martinez, Local 255; Don Brown, Local 506; and Larry Hopkins, Local 1177 presented a report on their audit of the national union’s books, which they found to be in order.